You attended "The Countdown" on Thursday, April 24 at select theaters across the country; now Drum Corps International asks YOU to make the call. This is your chance to be the judge, ranking and rating each of the six corps performances that you saw up on the big screen. After logging in as a member of the DCI Fan Network, fans will be asked to score each judging caption including general effect, visual, brass, percussion and color guard. 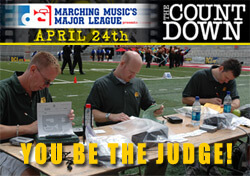 The corps performance receiving the highest average scores when judging is completed at noon ET on Saturday, April 26 will be named "2008 Countdown Champion." Top scorers in each caption also will be recognized. Stay tuned to DCI.org this weekend. Following the completion of fan judging on Saturday, April 26 at noon ET, the "2008 Countdown Champion" and caption award winners will be announced in a special Webcast video featuring an exclusive look at the April 26 Phantom Regiment rehearsal camp in Beloit, Wis. This Webcast video will be posted Sunday afternoon. Judge the six "Countdown" corps now!